Author, Debra Woods, will choose a winner from your shining moments this weekend. Winner will receive a copy of Debra’s book, It’s Okay to Take a Nap (and Other Reassuring Truths for Mothers Everywhere) courtesy of Debra. If you’d still like to be in the running, just post your best sleep-deprivation story as a comment under my “Brain Dead” post. Thanks to those of you who shared! It was great fun for me to laugh with you! A scary theme surfaced. Basically – brain dead negligence manifests itself most prominently when dealing with cars and car seats. So new Moms – be vigilant when you climb behind the wheel. Keep a wary eye. Children have been known to fly from car seats, be left in garages or mysteriously disappear! As for an update on the boys. Wednesday Spencer weighed 9 lbs 15 oz. Gordon 10 lbs 1 oz. They are sleeping more soundly through the night. 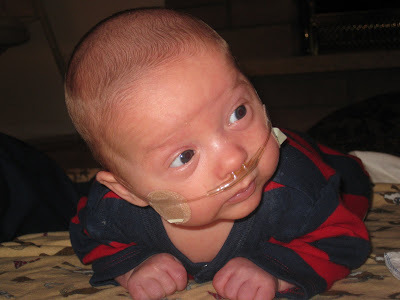 And cross your fingers… this is day THREE Spencer has been off oxygen. One more night and I think we may be able to toss “Oxy” out the window for good! Freedom! I am excited to hear about Spencer! I hope it sticks. I'll call you tomorrow!